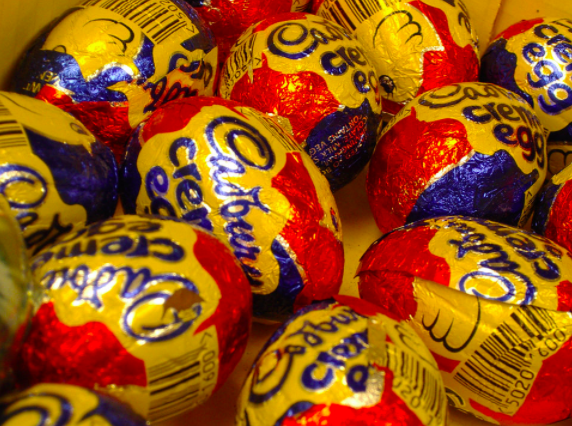 Is there anything more delightful in this life than scooping out the insides of a Creme Egg with your tongue? Yes, I hear you cry, and the answer is clearly being sat in your fuzziest slippers while devouring a piping hot pizza with abundant mozzarella and rich tomato sauce. Well, what if you didn’t have to choose between these two delights? What if you could combine them, melding the two treats into some sort of delicious yet visually confusing Frankenstein’s monster? Ricky Hughes – aka Mr Ricky, Prince of Desserts – has crafted a dish which could make you smack your lips with anticipation, but may also lead to you a regular visit to the dentist. This pizza is unlike anything you might sample at even the most maverick of Pizza Hut buffets. 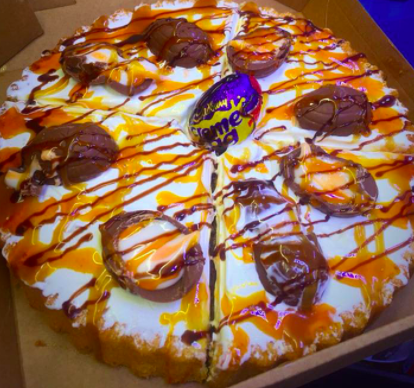 This base is smothered with Nutella sauce, ice cream and of course plentiful Creme Eggs, split in half with their sweet fondant goo spilled about liberally. Oh and there’s sprinkles and choccy shavings, you know just for if you fancied a bit of sugar. At £8, this alternative take-away contains a sofa-slump-inducing 2,200 calories. However, the strain on wallet and waistline alike is certainly not putting any loyal subjects off. Indeed, this treat-za is apparently the 28-year-old dessert-repeneur’s most popular creation. It’s by far our most popular creation, we are selling between ten and 15 every night. The feedback has been great, lots of five-star reviews online and customers coming back for more. Some love it so much they have even been ordering three or four times a week. We are always looking to expand our range to keep the customers coming back, and with the sweet pizza our customers can choose what they want for a topping, just like any other pizza. They can put Ferrero Rocher on top, Galaxy Caramel, whatever they want. 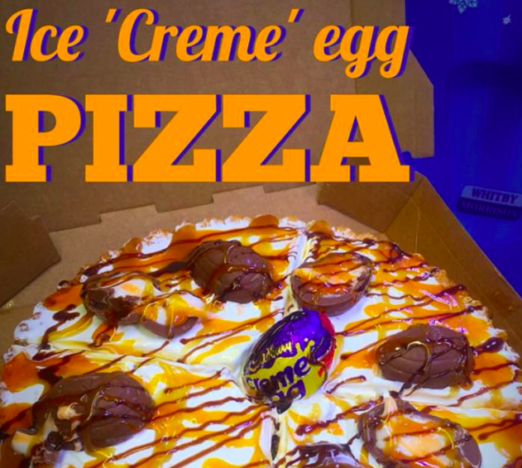 I must admit, as much as I love Creme Eggs and pizza equally, I’m not sure even my hardened junk food loving tummy could handle this gorgeous monstrosity. However, I have absolute faith that there are some sweet-toothed hard-nuts out there who would absolute demolish this and then go for round two for pudding. If you are such a person then you’ll find Mr Ricky cooking up a magical rainbow storm at his Colwyn Bay ice cream van in north Wales. You can also sample marvels such as Galaxy Caramel Pizza, Rainbow Unicorn Colours Ice Cream Tray, and The Kinder Bueno Waffle. #treat #icecream #icecreamvan #MrRickyPrinceOfDesserts ? Highly recommended if you haven’t done it already, ice cream delivered to your door, book via Facebook ?